What was that about the Game of Thrones season 8 premiere? Sorry, I'm already salivating over this newly released preview for the next episode in HBO's blood-drenched fantasy drama. Yep, a 50 second trailer for the untitled second chapter in Game of Thrones' six-part finale has dropped mere hours after its premiere aired over the weekend, and it promises bigger, bloodier things to come for our favourite Westerosian natives. It's about as spoiler-filled as they come if you haven't yet caught up on the latest developments in the Seven Kingdoms, but if you're up to date have a watch of the trailer below (which unexpectedly appeared in the US on HBO last night) and see if you can stomach the sheer amount of foreboding that practically thrums throughout every carefully hand-picked scene. 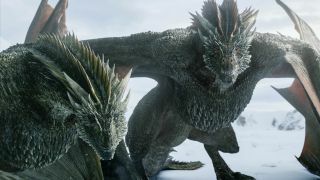 We know for a fact that Game of Thrones season 8 will feature the biggest battle ever constructed on-screen, and rumours suggest that battle will take place in the third episode, which airs on April 28. From where we're standing, then, this trailer is very much setting up that TV event to be the defence of Winterfell against the Night King and his army of White Walkers, which next week will set the stage for before episode 3 devotes its entire runtime to the big clash of sword and (Valyrian) steel. Beyond that, we get a glimpse of Daenerys finally meeting her father's killer face to face in the form of Jaime, who's arrived at Winterfell to offer his aid (and beg for mercy) in the fight against the undead. Will the Mother of Dragons look past her grudges to accept his help? And will Jaime tell them about Cersei's plans to walk back on her promises? This trailer is saying nothing for now. The sizzle reel also teases another tense standoff between Dany and Sansa, while a sombre Tormund - now back at Winterfell after his harrowing excursion to Last Hearth - is seen telling Jon that the White Walkers will be at their doors "before the sun comes up tomorrow." Welp. You'll be able to catch the next episode of Game of Thrones season 8 this Sunday at 9PM on HBO in the US, or the next day from 2AM GMT in the UK on Sky Atlantic and Now TV. For more on the current happenings in Westeros, check out the best Game of Theories theories to swot up on while you watch season 8, or watch the video below for a full recap of the recently aired premiere.